.:Soul:. Plugs! (For Ears!) | .:Soul:. Just slipped these babies into the main store! Mesh heads, and sometimes the SL head, can have larger holes when the ears are removed than you would normally want. And sometimes, you want no ears there at all! Here you go. Plugs! (For Ears!) are for all your ear-hole filling problems! 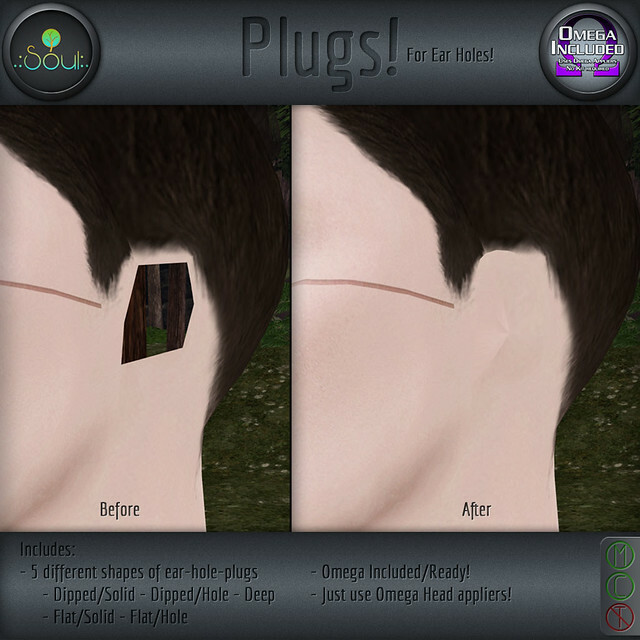 Each side is a separate piece for perfect fitting, and they come Omega Ready, so all of your Omega skin appliers that have head textures included will work! This entry was posted in Appliers, Body parts, Female, Male, New Releases, Unisex and tagged Appliers, body, ears, filler, Hole, Included, mesh head, omega, plugs. Bookmark the permalink. ← .:Soul:. Goes to SPAAAAACCEEE! I’ve been hoping to find something like this for quite some time to help with the finishing touches on a few non-human looks. I’ve tried a few temporary fixes and compromises (longer hair, tinting something to try to match skintone, etc.) but I was never happy with them.